According to AP ,The president arrives on the Massachusetts island on Saturday for a nine-day stay with first lady Michelle Obama and daughters Malia and Sasha. Obama’s spokesman says the president will be briefed regularly on the full range of issues while he spends time with family. No official public appearances are planned, though Obama’s motorcade will be seen whisking him to golf courses, beaches and restaurants. The president skipped vacationing on the island getaway for the wealthy and the well-connected during last year’s re-election campaign against Republican Mitt Romney. 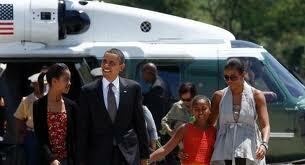 Obama is scheduled to return to Washington on Aug. 18.